Hy-Vee in Sioux Center held a ribbon cutting this (Tuesday) morning celebrating the grand opening of their new convenience store. Located along the frontage road in the SE corner of the Hy-Vee parking lot, Hy-Vee’s Fast & Fresh Express features fresh foods including pizza, sandwiches, salads, and the normal convenience store snacks and drinks. 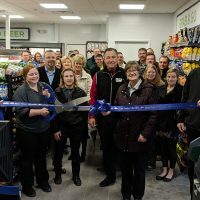 Hy-Vee store Director Chad Vondrak says the gas station was built to compliment the Hy-Vee Fuel-Saver program, and not to hurt anyone, stating MJ’s Sinclair just up the road is a good friend to Hy-Vee. Hy-Vee Fast & Fresh Express is open daily from 5am to 10pm, the gas pumps are open 24/7.